Police and prosecutors condemning mass incarceration ignore their own role in the problem. But ignore the role they have to play in solving the problem. Former New Orleans Police Department superintendent Ronal Serpas and New York City Police Commissioner William Bratton. Photo illustration by Lisa Larson-Walker. Photos by Sean Gardner/Getty Images, Andrew Burton/Getty Images. Some of the biggest names in American law enforcement gathered in Washington on Wednesday to declare their support for reducing the number of people in jail and prison and to assert their belief that lowering the incarceration rate will not lead to an increase in crime. It was a powerful demonstration of the dramatic shift in the politics of law enforcement in America in recent years, with police brass from some of the country’s largest cities—including New York, Los Angeles, Houston, and Chicago—joining prosecutors to state in unequivocal terms that the criminal justice system is locking up too many people who don’t need to be locked up. For this influential group to say such things is unquestionably significant. Their willingness to call for a more lenient criminal justice system will provide political cover for lawmakers and other officials who might otherwise balk at supporting reform efforts for fear of being accused of coddling criminals or being anti-police. It will also make it a lot harder for advocates of tough-on-crime policies to argue credibly that the massive drop in crime that the U.S. has seen since the 1990s is the direct result of mass incarceration—an intuitive, common-sense theory that has nonetheless been proven wrong by the best academic research on the subject. But for all the welcome sounds these 130 police chiefs, sheriffs, and prosecutors are making, something important is missing. From the group’s “Statement of Principles,” which centers on drug treatment programs for addicts, the reclassification of some nonviolent felonies to misdemeanors, and the elimination of some mandatory minimum sentences, it’s clear the authors believe that the burden of reducing the prison population falls mainly to lawmakers. Absent from their vision for how to solve the problem of mass incarceration is any mention of the vast discretion that police departments and prosecutors’ offices have in deciding who to arrest, and what kind of charges, release conditions, and prison sentences to push for in court. “Discretion,” in this context, refers to the power that law enforcement agencies have to focus their energies and resources on what they think is important. It plays out on a case-by-case basis but tends to be informed by an overall strategy. So if a police chief decides that his department will give out tickets instead of arresting people for quality of life offenses like drinking beer on the sidewalk—as McCarthy did as the top cop in Chicago, and previously, Newark—he’s asking his officers to use discretion when confronted with instances of low-level law-breaking. Or when a district attorney decides not to bring cases against people who have been caught with small amounts of marijuana—as Brooklyn D.A. Kenneth Thompson did in 2014—he’s encouraging his prosecutors to use their discretion in making charging decisions in order to spare minor offenders jail time. The fact is that if the heads of law enforcement agencies are serious about reducing the incarceration rate, there’s a lot they can do on their own to help make that happen. Just look at what Attorney General Eric Holder did in 2013, when he issued a memo calling on the nation’s federal prosecutors to avoid triggering mandatory minimums for non-violent drug offenders who don’t have ties to gangs or organized crime. That policy change, which required no buy-in from legislators, had an immediate effect, resulting in a 20 percent drop in the number of federal drug cases that carried a mandatory minimum. For these individuals to place the blame for mass incarceration almost entirely on punitive laws, while ignoring the fact that they have an enormous amount of control over how those laws are enforced, is akin to a smoker saying he can’t quit until cigarettes become illegal. If the prosecutors in the group think mandatory minimums for nonviolent offenders are a bad idea, then they should be using their bully pulpit to call on the nation’s prosecutors to stop charging arrestees as aggressively as they can and using the massive penalties that come with those charges as weapons during plea bargaining. And if the police chiefs in the group think their cities’ jails are too full of drug offenders, why aren’t they calling on all 18,000 police agencies across the country to stop putting handcuffs on people for simple possession? I asked Garry McCarthy on Thursday about why his group’s Statement of Principles is so focused on the need for new legislation, and not focused at all on what the people who signed on to it could be doing on their own. He answered by denying that police officers have the kind of discretion that they most certainly do have. That might be true on paper, but the reality is that police officers are constantly making decisions about whom to ticket and whom to arrest based on judgment calls and departmental priorities. And while there’s no question that lawmakers have a role to play in sending fewer people to jail for possession—law enforcement does too. When New York Mayor Bill de Blasio took office, he made it a priority to give cops the leeway to issue marijuana users citations instead of placing them under arrest. 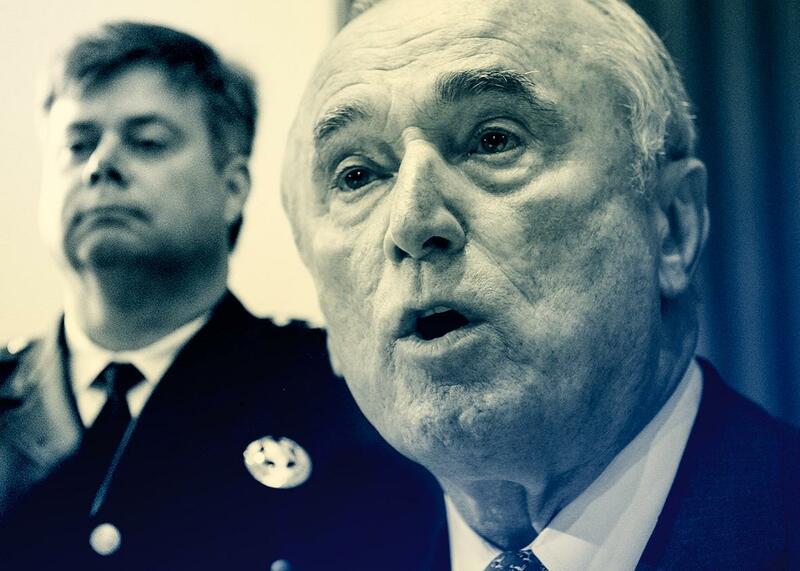 De Blasio’s police commissioner, William Bratton—who might be the most prominent police chief to sign on to the new reform group’s Statement of Principles—takes a dimmer view of marijuana use than his boss. But on Oct. 8, he made a very public show of using discretion—one that will surely have an effect on the rank and file—when he noticed a college student smoking pot in broad daylight, and instead of arresting her on a misdemeanor drug charge, snatched her joint and threw it away. If the reformers who stood on stage Wednesday in Washington—and met with President Obama on Thursday—are serious about taking a leadership role in the war on mass incarceration, they should be encouraging police departments to change their practices accordingly. And the district attorneys who are working alongside them need to acknowledge that historically, their offices have behaved as though being a good prosecutor means always pursuing the maximum penalty in every case. It is an unambiguously promising step in the right direction for some of the nation’s top law enforcement leaders to have lined up behind the need for a less blindly punitive criminal justice system. Their calls for decriminalization, sentencing reform, and drug treatment programs matter, and they will probably help bring about change. At the same time, these leaders need to take responsibility for the role they themselves could be playing to help this country end its addiction to jail and prison. That means going beyond calling on other actors in the justice system to make the system less harsh, and seizing the immense power they have to do so themselves.